Thought I'd post a fun shot from a recent challenge I'd taken on, with a good friend of mine last week. You can see Dave Pratt's work on Flickr. 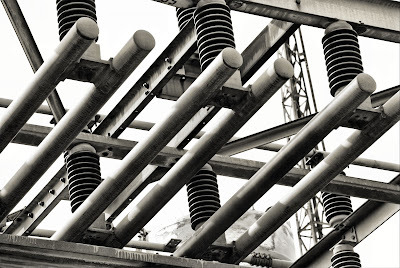 I wound up in the very industrial section of Burlington Street in Hamilton and allowed all the unusual and interesting shapes along all the different power grids and steel mills to become subjects all on their own. I don't have anything overly wise to say today, but I think I'll let the photograph speak for itself. It's the first official day of March Break for my family and I and I see pancakes in my future... so you understand why I'm keeping this short and sweet. Have a great Monday gang, and thanks for the ramble! Don't Miss Them ~ Telephoto Tuesday. Don't Despair. Keep Shooting. ~ Telephoto Tues. Using Size & Space ~ Mono Monday! Spring Tide Arrived! ~ Floral Friday! This Isn't New ~ Exploration Thursday!